So after a long layoff since the Dodgers beat the Braves, the Dodgers traveled to frigid Milwaukee to face the Brewers in game 1 in the NLCS. Clayton Kershaw took on Gio Gonzalez. Manny Machado took Gio deep in the 2nd inning and the Dodgers took a 1-0 lead. Gio was finished after two innings and the Brewers went to their vaunted bullpen early. The Brewers made Kershaw work and they kept working to count and fouling off pitches. In the bottom of the third the game changes. Brandon Woodruff who is a pitcher took Kershaw deep to tie the game. In the inning, Yasmani Grandal has two passed balls and two errors. Kershaw had to extend himself as he couldn’t put hitters away and ended up giving up another run in the inning and the Brewers took a 2-1 lead. In the bottom of the fourth, with a runner on first Orlando Arcia hit a single and then an error by Chris Taylor moved runners to 2nd and 3rd. Pinch hitter Domingo Santana hit a single to score two runs. The Brewers took a 4-1 lead and Kershaw’s night was over. The shortest post-season start of his career. The defense didn’t help. Ryan Madson came in a gave up a run and the score was 5-1. The Dodgers were stuck on one hit for the longest time. The Dodgers were stuck on one hit for the longest time until Chris Taylor hit a single in the 6th inning. Josh Hader for the Brewers pitched three scoreless innings and pitched the most pitches he’s pitched this year. Julio Urias pitched the 7th inning and gave up a solo shot to Jesus Aguilar and the Brewers took a 6-1 lead. The Dodgers rallied in the 8th inning. Yasmani Grandal singled, Joc Pederson hit into a fielders choice. Chris Taylor singled. Justin Turner then struck out on a questionable call. Max Muncy then walked. Manny Machado hit a single on a full count to score two runs. Matt Kemp followed up with a single to score a run and the score was 6-4 Brewers. Yasiel Puig came up to bat with a chance to take the lead and struck out. In the top of the 9th with two outs, Joc Pederson took the count full and walked. Chris Taylor on the next pitch hit a shot in the gap that went off Lorenzo Cain‘s glove and he tripled scoring a run to make the score 6-5. Justin Turner came up to bat as the lead run. He struck out for the fourth time in the game and the Brewers held on 6-5. The home run by Woodruff was the difference. The Dodgers fought hard and will come back tomorrow with Ryu at 1:09pm for game 2. What a nightmarish game. 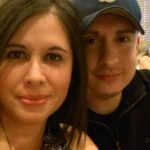 MIL played their cards right, exposing the Dodger Lefty Lineup, and then switching to a R/H’r, forcing the Dodger hand. Kershaw was not at the top of his game, giving up a HR to a pitcher, coupled with Grandal’s 2 PB’s and 2 errors, the Dodgers found themselves scrapping for runs. Machado showed up, but JT and Puiggy did not. Boils down to wasted opportunities. Take it, they did come back and make a game of it, only to come up a dollar short. Grandal’s miscues just dug too deep a hole for them to dig out of. Today’s loss makes tomorrow a must win situation. Might be better off benching Grandal tomorrow. Wow. I thought it was a great game. Definitely not nightmarish. Not sure why the next game is must win. Grandal had a tough one. Turner too. But I’m skeptical if the Brewers all ‘pen strategy can work over an extended series. Already Hader is off the playing board. I agree here, but not happy to see Barnes starting. He’s such a terrible hitter, worried that he’ll stink up the lineup and kill several rallies. Great? Come on Bluto. There was nothing great about that game. It would have been a good game had they came back and won, but great? Please. It was horrible baseball. Kershaw was bad, Grandal was worse. and the offense for 7 innings did nothing. Until Machado’s broken bat single scored 2, the offense was about as active as the old folks who live in my building. The defense was pathetic. That is not good baseball. Todays game was a must win because you do not want to go home down 2-0. They managed to avoid that and now they have home field. With some luck, and good baseball, they can end this thing and not have to return to Milwaukee. Turner redeemed himself today, Grandal added to the negative side of his ledger. Puig did not have a very good game either. But they won. So now it is 1-1 and they are back in Dodger Stadium with Buehler and Hill set for the next 2 games. Most likely Kershaw in game 5 and if needed Ryu in game 6 back in Milwaukee. Yep, and you must be either a masochist or really into bad baseball because that game was the epitome of bad baseball. Grandal’s lousy game and an unusual 4 K game for Turner, and it spelled defeat. The defense was abysmal. 4 errors, 2 by Grandal one by Taylor and one by Turner. Kershaw hung one to the opposing pitcher and the rout was on. The Dodgers came back and Turner struck out for the 4th time with the tying run just 90 feet away. Taylor came with in 2 feet of tying the game only to get a triple. The strikeout reared it’s ugly head again as the team K’d 13 times. Turner 4, Grandal 2, Muncy 2. were the worst culprits. Grandal threw in 2 passed balls for good measure. Just a horrific game and yet they came within a whisper of winning. They should get a better game from Ryu tomorrow. He has been their best pitcher down the stretch. Had Urias not given up the homer, they would have tied the game, but had not’s and maybe’s do not win games. Tomorrow’s game now crucial to Dodger chances, but LA has also seen all that the Brewers have in their pen and Hader will most likely not be used again tomorrow. He threw a lot of pitches. 1) With the pitcher Woodruff down with two strikes, Kershaw hangs a fat, juicy, meatball for a home run. 2) Grandal’s abysmal two error, two past balls performance. This lose is pinned on Grandal. 3) JT, Puiggy, and Bellinger choking on key scoring opportunities. 4) Offense records 13 strikeouts, 4 by JT alone. 5) Urias giving up a dinger, which ended up being the winning run. 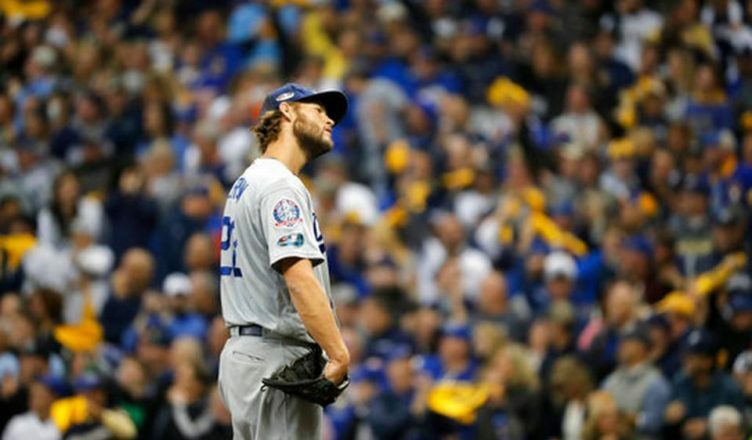 6) Kershaw no longer the dominating pitcher he once was. No longer can he be considered “The Ace” of the staff. Three innings and done, will not do it. 7) Kemp does not look healthy. Could his knees have given out? He seems to have put on a few pounds…. could this be from sitting on the bench too long? 1) “The Smirk” opening up the game with a line drive solo shot. 2) “The Smirk” contributes a 2-4, 3 RBI performance. 3) The ability to come back and make a game of it. 4) Wearing down the MIL bullpen. 5) Maeda strong out of the pen. 7) Yelich was held to 0-4 with 3 KO’s. 8) Even with all the errors, K’s, missed opportunities, the Dodgers only lost by one run. Proving that MIL can be beat, and should have been beat last night. 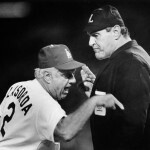 It is not over until Lasorda sings. Go Blue! Gotta disagree with assessment on Kemp. What does “Kemp does not look healthy” mean? I think he has done well with the few abs he has been given. Grandal is the goat, plus Kershaw did not pitch well and had better find a way to increase his velocity. Turner’s 4 s/o effort has got to improve and Bellinger needs to hit sometime as he has not had a hit in 15 abs this postseason. I am not sure yet whether or not Urias can be trusted to deliver. We shall see. A catcher has to be able to catch a ball thrown to him. Grandmal has shown that he is deficient in both catching balls thrown by the pitcher or thrown by a fielder. I’m glad I was at an Oktoberfest and didn’t have to watch this abortion of the game of baseball. This was possibly the worst performance by a catcher I’ve ever seen. This game is on Grandal, period. Granted, there were other weak performance issues by Kershaw and others, but Grandal’s were unacceptable. The throw to the plate bounces off his glove? WTF? His defensive performance is grounds for divorce, IMO. I hope his wife makes him sleep on the couch for a week when he goes home. If they don’t sign Manny, I’d be seriously looking for a catcher if I’m the FO. Just sayin’ Kemp looks slow on basepaths, sort of hobbling. Also sporting a “spare tire” and gut. Not the “ripped” Kemp we saw at the beginning of season. I will take a look at Kemp today. He may have picked up a few. Thanks for the observation. Kemp does not look fatter or slower. He looks exactly the same as he did at the start of the season. He may not be generating as much power as he was earlier in the year, but he is fine. Lack of playing time is the only drawback I see. Grandal not in the lineup today thank goodness. Taylor gets the start in CF and leads off. He had 3 hits last night. I do not expect a repeat of last nights game from Turner. Freese back in the lineup at 1st to begin the game. I think part of the reason they struggle sometimes is because Roberts pulls the switch way too early. He replaced Freese after 1 at bar with Muncy, who ended up doing nothing. I would much rather have seen Machado hit his homer when he came up with the bases juiced than the 1 run shot he hit in the 2nd inning. Lack of clutch hitting has hurt this team. I think the Kershaw we saw last night is what we can expect sometimes. He was laboring from the beginning and the Brewers plan to attack him early in the count is what teams who were very successful against him did all year. If you jump his first pitch, it is usually the best pitch you are going to see. Lets hope Ryu is much better today. He is better at home than on the road, but he can rise to the occasion sometimes. Oh by the way Blue, Kemp is not hobbling. He ran as fast as he needed to since both of his hits were singles. Had he crushed one off the wall, he would have no doubt busted it. He also was running well in the outfield. TV makes you look heavier than you are. Most ballplayers lose weight during the season, they do not put it on. So tired of our lack of urgency. We need to get to Miley before they go to the Pen. We just look dead out there. A lot of stale plate approaches right now. Why does Kemp only get 2 abs before being lifted. Say what you want but Dummy is the problem. let’s not forget Puig’s horrible AB before him.